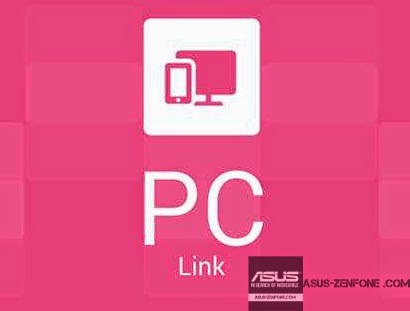 ASUS PC Link can easily synchronize the text in the clipboards of your PC and your mobile device. 1. Copy the texts on your PC by the way you prefer, like Ctrl+C. - Focus on any input field, paste the texts by Ctrl+V. - Focus on any input field, click and hold the mouse button until the “PASTE” notification button popped-up. Click the “PASTE” button to paste the texts. 3. Long pressed by your finger directly on the mobile device until the “PASTE” notification button popped-up. Click the ”PASTE” button to paste the texts. 1. Select and copy the texts on your mobile device. 2. Paste the texts on your PC by the way you prefer, like Ctrl+V. 1. The behavior of clicking and dragging by your mouse on ASUS PC Link Windows application is the same as tapping and dragging by your finger on your mobile device. 2. Roll the mouse wheel to scroll the application screen or browser pages on ASUS PC Link Windows application. 3. Type by your keyboard with any input method on your computer. 1. Click the icon . 1. Connect your mobile device and your computer by a USB cable. 2. Start ASUS PC Link application and keep it in the foreground. 3. 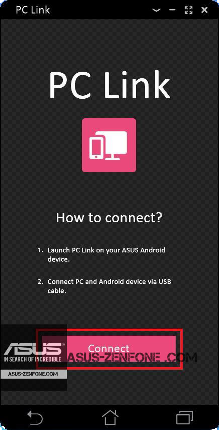 Start ASUS PC Link Windows application on your computer, click "Connect" button to establish connection. If there is any problem when establishing the connection, please refer to the Trouble Shooting page. 4. Press the "OK" button when the input method dialog is popped-up. 5. Now you can control your mobile device by operating your ASUS PC Link Windows application. If there is any problem when establishing the connection, please refer to the TroubleShooting.